Barnsley opened workhouse in around 1736 on St Mary's Place, on what had formerly been the site of Brookhouse's almshouses. A parliamentary report of 1777 recorded local workhouses in operation in Barnsley (for up to 30 inmates), and in Carlton Parish (12 inmates). An 1821 directory recorded the Barnsley 'House of Industry' as being on Bank Lane, with Francis Batty as its governor. In 1828, the workhouse was recorded as being on St Mary's Place, again with Francis Batty as Governor. In 1832, the workhouse had 60 inmates (28 male, 32 female), from 2 to70 years of age. The building was enlarged in 1833. 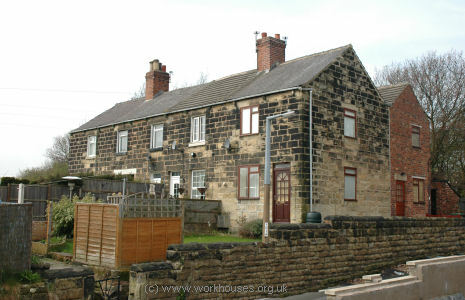 Barnsley and Hemsworth are also said to have once shared the use of a workhouse at Ackworth Moor Top, at the north side of what is now the Barnsley Road. The location of the building is shown on the 1854 map below. Ackworth former workhouse from the east, 2006. West Riding: Ardsley, Barnsley (5), Barugh, Billingley, Carlton, Cudworth, Darfield, Darton, Dodworth, Monk Bretton, Nether Hoyland, Notton, Royston, Stainbrough, Wombwell, Woolley, Worsbrough (2). The population falling within the union at the 1841 census had been 30,935 with parishes and townships ranging in size from Billingley (population 220) to Barnsley itself (12,310). The average annual poor-rate expenditure for the period 1846-8 had been £8,031 or 5s.2d. per head of the population. The new union initially retained the existing St Mary's Place workhouse. After the opening of the new Gawber Road workhouse (see below), the old workhouse site was occupied by a police station which operated until the 1960s. St Mary's Place workhouse site, 1850. The union's new purpose-built workhouse was erected in 1852 at the south side of Gawber Road in Barnsley. It was designed by the team of Henry F Lockwood and William Mawson who were also the architects of other Yorkshire workhouses at Bradford, Dewsbury, Kingston-upon-Hull, North Bierley and Penistone. Their design for Barnsley included a low entrance block at the east, behind which stood the T-shaped main building. Other blocks to the west of the main building may have included the original infirmary to which additions were made in 1875. A major enlargement took place in 1880-3, with a large pavilion-plan infirmary costing around £16,000 being erected to the south of the workhouse, and new boardrooms, committee rooms and waiting rooms being added to the workhouse itself. The site location and layout are shown on the 1904 map below. A picture of life at Gawber Road has been provided by the late Thomas Fretwell who was placed in the workhouse after the death of his mother in 1918. His account, compiled from notes made in his 70s, has now been turned into a short book by Lyn Howsam who has kindly provided the following extracts. Although this was to be the most dramatic day of my life it was not until later that I became aware of it. It had started, as all school days usually did, with a quick wash under the tap in the sink, a slice of bread and jam, a mug of cold water and then my big sister Elizabeth pushing and pulling me through the cobbled streets of Barnsley to the Holyrood School. She had thrown a shawl over my head and shoulders as protection from the rain and cold because all I wore all year round was a pair of short torn trousers and a thin torn coat, stockings and boots with holes in the soles. My shoes were fastened with string and my socks also held up with string. I was miserable and cold, constantly wiping my running nose on the sleeve of my coat that was shiny with regular use. On arriving at the school my sister pushed me through the gates to await the ringing of the school bell. We were formed into lines by the nuns and led into school but within a few minutes we were marched out again to enter the Catholic Church, which was next door to the school. Here we were shown how to dip our fingers in the holy water and make the sign of the cross on our front. The walls of the church were lined with saintly statues with a figure of Mary and child at the side of the altar. She had a fixed smile and I am sure she was thinking 'poor little sods'. We were told to kneel, which we did, on the cold slabs that covered the whole floor. The nuns stood near the walls and the prayers were said by the head nun. Our knees by this time had frozen to the stone slabs but the head nun kept on, regardless of our discomfort. On arriving home from school for dinner, we saw a small group of women standing around our doorway all wearing shawls and they appeared to be in a state of excitement. My sister pushed through the crowd into our house but a few minutes later came out crying and eventually I was made to understand my mother had died. Here I was bathed and given a huge nightshirt and put to bed in a big ward full of old women. Terrified and feeling resentful against my brothers and sisters for abandoning me I cried myself to sleep. Sometime during the night I became aware of the nurses pushing a trolley out of the ward. Later I became quite used to this sight and learned that one or two of the old ladies died every night. The nurses and the old ladies were very kind to me. One old woman gave me a small book and taught me to read the words, which were 'twinkle, twinkle little star.' I kept this book until I was quite big. I remember crying most of the time. I also remember looking through the window and watching the stars, wondering which one was my mother: praying to the angels to come and take me high in the sky to be near her. I was told I would be going into the Workhouse Orphanage. The Orphanage, which was a very big building, was surrounded by three walls but was still within the grounds of the Workhouse. We all slept in hospital type beds; the boys on the first floor the girls on the second. Here I just became one of many and had to stand up to bullying from the older children. There was a big playground surrounded by high walls where we played. One of the big attractions was a big wooden rocking horse rather shabby with bits missing from it but that didn't stop us fighting over it. The longer I stayed the less I liked it and was glad when I was eventually moved to Ashley House, a Catholic Orphanage just off Park Road near to my old home. It was a big house with the name Ashley House stencilled in faded gold lettering over the front door with two large iron gates to the wide drive. This led past the side of the house into a huge playground, which was surrounded by two high brick walls. At the top of the yard was an open fronted shelter containing a big white wooden table. On the back wall of the shelter was a long seat built into the wall and in front of the table were two wooden forms. This was supposed to be our dining room when the weather was not too rough although I can remember having meals here during snowstorms. Friday nights were bath nights. Immediately after tea we were given a good scrub with the brushes the girls used on the floor. No fancy smelling soaps just carbolic and should this get into your eyes it really was painful. Then we were given a flannel nightshirt each some reached down to our feet. Some only just covered our knees because they had already been cut down to repair other night-shirts. Then we were lined up in front of the Matron who gave us a dose of brimstone and treacle then off to bed. We used to tie our clothes up with the jacket sleeves and shove them under the bed because we had no other furniture in the room apart from the hospital type beds which were kept spotlessly clean by the big girls. They also scrubbed the floors two or three times a week. It was a soul-destroying routine but we were much better off then the other kids we met at school, they were dirty and poorly fed, a lot of them dressed in rags with shoddy footwear. After 1930, the site came under the control of the West Riding County Council. The infirmary part of the site became St Helen's Hospital, while the main workhouse building provided geriatric care under the name of The Limes. 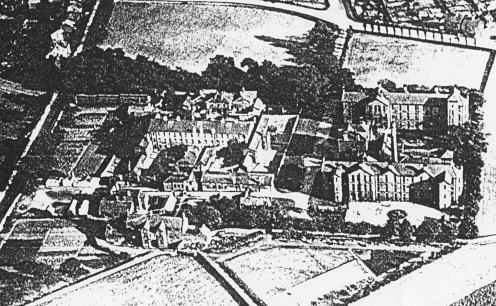 Towards the end of the twentieth century, a major reconstruction of what is now Barnsley Hospital resulted in the demolition of all the old buildings. Barnsley from the north-west, c.1928. The Barnsley Union established a children's home at Ashley House, Princess Street, Barnsley. In 1924, the home could accommodate 24 children with J.W. Webster as Superintendent. Barnsley Archives and Local Studies, Town Hall, Church Street, Barnsley, South Yorkshire, S70 2TA. Relatively few records survive. Holdings include: Guardians' minute books (1850-1930); Various committee minutes.